Was the Human Brain Unleashed? Compare humans to other mammals and a distinguishing feature stands out: our large, cavernous craniums, and the densely folded brains stuffed into them. The human brain is more than triple the size of the brain of chimpanzees, our closest relatives. In particular, it’s the cerebral cortex—the wrinkled outer layer of the brain—that sets us apart. Whales and elephants also have big brains, but they can’t match our cortex in the sheer number of neurons and billions of connections among them. It’s obvious that our big brains are responsible in some way for enabling the unique things that humans do: developing languages, music, and art; using sophisticated tools and technologies; forming complex societies. But what is it about a bigger brain that makes these feats possible? Randy Buckner, professor of psychology and of neuroscience, and his former student Fenna Krienen, Ph.D. ’13, have proposed a hypothesis to explain how the evolution of a large cortex may have enabled the distinct cognitive skills that humans display. The key is not just size but organization. 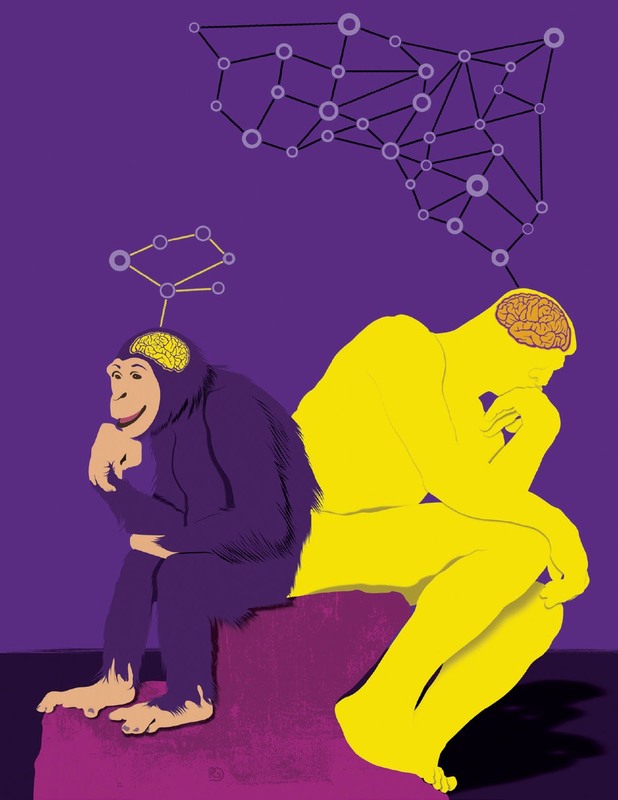 As the human brain swelled, they argue, the cells in newly evolved areas were increasingly freed from constraints that patterned the simpler connections in other areas, and thus able to connect to each other in more complex ways that enabled new kinds of thinking. The human cortex can be divided into two types of regions. One type includes the sensory and motor cortices, which process bodily sensations such as olfactory, gustatory, auditory, and visual information, and also control movements. These regions evolved early and are therefore similar in all mammals. But humans also possess a great deal of brain mass interspersed among these motor and sensory areas. Called “association cortices,” those intervening areas are responsible for many of the tasks we associate with higher-level thought. We know from animal studies that the flow of information in the sensory and motor areas follows a relatively simple, stepwise path. When visual information comes in from the retinas, for example, it’s handed off from neuron to neuron through the visual cortex according to a chain of command. The raw sensory data are processed in more complex ways as they make their way to different areas. To understand the organization of these association areas in the cortex, Buckner’s lab has imaged the brains of hundreds of people asked to lie in an MRI machine, doing nothing, so that researchers could study the spontaneous connections among different brain regions. Rather than follow a chain of command for information flow, the association areas seem to chatter with one another simultaneously through networks of cells connected across long distances. “Each of these networks has multiple components in each of the lobes across the brain,” Buckner says. If the neurons in the sensory and motor areas seem to be playing a game of telephone, in which information follows serial paths, the cells in the association areas use a communications strategy more like the Internet—with lots of simultaneous connections and pathways. Buckner and Krienen looked for a simple way to explain this phenomenon. Association areas not only evolved later in humans, they also form later in an individual’s development, explains Krienen, now a postdoctoral fellow at George Washington University. As new neurons form at specific sites in the developing brain, nearby cells secrete molecules that instruct the neurons on what part of the brain to travel to and what functions to perform. The sensory and motor areas are close to these instruction centers, but the neurons of the later-forming association areas are located between and far away from the centers where the instruction molecules originate. These cells, Buckner and Krienen reason, may become increasingly untethered from the instructions that keep the older areas of the cortex so strictly patterned, and—freed from dedicated motor and sensory tasks—may instead develop a new kind of organization. “We’re making the hypothesis that as things get bigger, these in-between regions start wiring to each other,” Buckner says. The organization didn’t evolve specifically to let humans be social, develop language, or make elaborate plans for the future, he notes—but those abilities may have been made possible by the scattered networks that emerged. Thus, instead of relying on dramatic genetic changes to explain how the human brain evolved, the theory posits that the organization emerged as an effect of increasing size. Buckner and Krienen outlined their “tethering hypothesis” last December in the journal Trends in Cognitive Sciences. Krienen hopes the work will spur other scientists to explain the basis of the seemingly unique qualities of human brains.